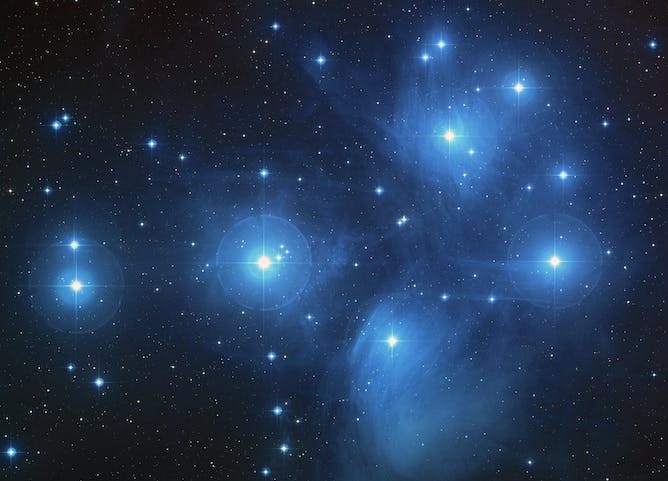 The Pleiades, or Seven Sisters, is one of the most obvious star groups in the night sky, identifiable to the naked eye. In Aotearoa/New Zealand, the star cluster is known as Matariki. This name is a truncated version of the saying “Ngā mata o te ariki Tāwhirimātea” meaning “the eye of the god Tāwhirimātea” – and there’s a growing trend to celebrate its pre-dawn rising at this time of the southern winter as the Māori New Year. But often the celebration takes place before the stars are visible in the sky and many people are unaware of the history and traditions behind it. Unlike western New Year, the dates of Matariki change year by year. This year Matariki set on May 19 and will rise again between July 17 and 20. Māori use the name Matariki to describe the entire cluster as well as the main star in the group. Many other stars in the cluster have their own name and particular purpose. Astronomy, the study of the cosmos, is the stuff of legends in every culture, but Matariki has a practical meaning as well. For millennia, people have lived without a calendar, and for Māori, the position of the stars was important for local survival. The rising of Matariki marked the change of seasons, the time to harvest, the migration and spawning of species and the cycles of the environment. Alongside the practical and robust science, the stars were intertwined with spirituality and beliefs. Māori would observe the sky from sunset to sunrise and take meaning from the stars’ position, colour, movement and brightness. They took all kind of omen and meaning from the heavens, believing stars foretold fortune and future. It was the job of the tohunga kōkōrangi (astronomical expert) of the area to determine the meanings of the stars in the cluster and to share predictions with the people. It was a skill built up over many years. The position and brightness might tell them what the weather would be like for the year, or that it would be a bumper fishing harvest. There was also an intimate connection between Matariki and the dead, and when the cluster rose in the pre-dawn sky in winter people would weep and call the names of those who has passed during the year. The Matariki (Pleiades) cluster consists of about 3,000 stars, at a distance of 400 light-years from Earth. NASA, ESA, AURA/Caltech, Palomar Observatory, CC BY-ND. Missionary William Colenso noted that Māori had the astonishing ability to see a greater number of stars with the naked eye than their pākehā (foreigner) counterparts. It was widely recognised in the late 1700s and 1800s that Māori knew more about the night sky than the Europeans arriving in Aotearoa. But colonisation affected Māori cultural practice and by the beginning of the 20th century the elaborate Matariki celebrations were no longer practised. The Māori system of time was synced with the lunar calendar, but that was then overtaken by the Gregorian solar calendar – and these two systems of time are incompatible. The easiest way to find Matariki is to look for other identifiable star groups, for example Orion’s belt, also known as the pot (Tautoru to Māori). Moving right to left along the three stars at the base of the pot, the observer comes first to a triangular-shaped cluster known as Hyades or the face of Taurus the bull. Go left again and you’ll notice a small group of stars clustered closely together. This is Matariki. It is widely accepted that the Māori year began with the rising of Matariki, but there are differences of opinion about when Matariki was observed and the length of the Matariki period. A number of writers say the Matariki New Year began with the new moon after the cluster is seen in the sky before dawn. Others say it was tribal, or region-specific, and could be observed after the full moon, or in the new moon, or in the periods between. All agree that for Māori the most important time for observing the stars was morning, just before sunrise. Matariki is what’s known as a third magnitude star. Magnitude is what astronomers use to measure the brightness of an object in the night sky as seen from earth. The lower the magnitude the brighter it is. When searching for stars on the eastern horizon before the sun rises, you have to take into account the glow of the sun, the position of the moon, atmospheric conditions, local typography and the magnitude of the star. As a third magnitude star, Matariki will need to be at least five degrees above the horizon and the sun at least 16 degrees below. In Matariki: the star of the year, I discuss evidence that the correct time to view the cluster is when it is visible in the morning sky, but for some reason we have begun to celebrate in the new moon, which is too early; Matariki cannot be seen during the new moon phase. This rather diminishes the whole reason for the ceremony and celebration. The point is to take direction from the stars, to make a connection between the celebration and the environment. It’s about responding to the environment, aligning with it rather than trying to shape it to suit ourselves. It’s timely and appropriate for the traditional practice of Matariki to be resurrected, reintroduced and correctly observed, centred on traditional practice and underpinned by Māori culture and Māori language. Featured image: My star gazing profile. Rangi Matamua. We manage to cope with Easter, where a feast based on the lunar calendar has to fit a solar calendar, so I don’t why why Matariki cannot be a moveable feast in the same way.